Image example Weah, wey be di first African to win di Ballon d'Or football award, lead with 39% for di first round of di election. Former football star wey be one of di presidential candidate for Liberia election- George Weah, attend di Sunday service of Synagogue Church Of All Nations (SCOAN). During di sermon wey show live for Emmanuel TV, di leader of di church Pastor T.B Joshua welcome Weah well-well and announce give di congregation say e 'brother' dey around. "My brother dey here today because e love im country and want di choice of God for e country. E no come here to by force imself to be president . E come here to know wetin God talk about im country, Liberia. Wetin be God opinion?" Pastor T.B Joshua come also talk say e no dey favour any person or political party, but di role wey im dey play na to pray for di will of God to happen for di country. Dis no be di first time wey big ogas dey carry waka come visit dis church. Other big visitors wey don come before include Tanzania President, John Magufuli, di before President of Ghana wey don die; John Atta Mills, Zimbabwean Prime Minister Morgan Tsvangarai and South Africa opposition leader Julius Malema. Image example George Weah na Senator for Montserrado County inside Liberia. According to Nigeria internet tori people - TheCable, former Liberian warlord, Yormie Johnson, and one of di 20 candidates wey join for di first round of di election inside Liberia, follow Weah go di church. 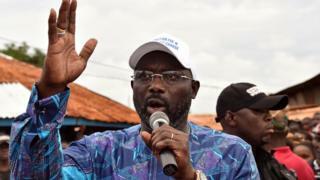 Di presidential run-off election between Weah and Vice-President Joseph Boakai go hold for 7 November 2017.